The chaise lounge is a design from See’s 1818 collection, and the cloverleaf ottoman was custom designed for the space. Photo by David Cobb. 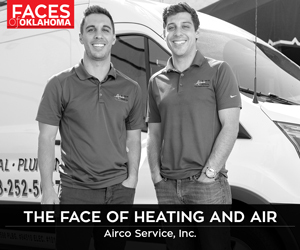 When Corbin See, his wife Sarah and brother Ross began a residential design for a new client, it was like “a changing of the guard.” Their client was the granddaughter of the home’s original owner, and their father – Carson See, founder of Sees Design in Oklahoma City – created the home’s original design more than 30 years ago. Well-known local architect Raymond Carter designed the sprawling, 4,500-square-foot Oklahoma City residence in 1978. “Our goal was to honor the tradition of the house, but modernize it,” says See. Walls were moved, closets were transformed into bathrooms and the original kitchen was gutted. The entry maintains the original red marble flooring with a travertine inset but is accented with a custom hair-on-hide area rug. The black leather chairs are from an Italian company that acquires vintage frames, then burns and chars them, giving each chair its own unique look. Juxtaposed between the two traditional chairs hangs Hudson Furniture designer Baran Baylar’s classic Mother chandelier, made of yards of highly polished, jewelry-quality, nickel-plated chains draped from laser cut bands. The adjacent living room features paneled walls painted soft white. The original wood flooring was refinished, and a custom wool and viscose area rug provides a subtle foundation for the various seating areas throughout the room. A new, custom cast-carved mantle was designed to appear vintage. Adjacent is a one-legged, cast iron ball-and-claw foot console. Above is a new mirror constructed from pieces of vintage mirrors. Many of the upholstered pieces are from Sees Design’s sophisticated 1818 hand-crafted furniture line available exclusively through David Southerland Showroom in Dallas, including the sofa across from the fireplace. The floor lamp behind the sofa is wrapped in a bronzed octopus tentacle. Above is one of a pair of French chandeliers dating to the 1940s and constructed of painted steel. The tall armoire featured in the room belonged to the client’s grandfather and was retained from the original design. 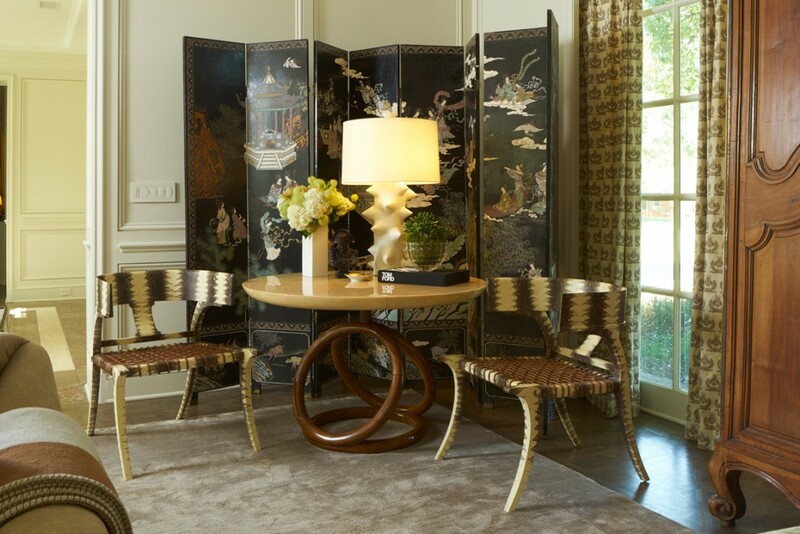 Nearby is another exquisite piece from the original home design – an antique eight-panel Chinese Coromandel screen. The table in front of it is wrapped with goatskin parchment and coated in resin, while the side chairs are wrapped in python skin and have woven leather seats. So the couple can host larger groups to watch televised events, a large flat screen television was recessed into the wall and is hidden when not in use. 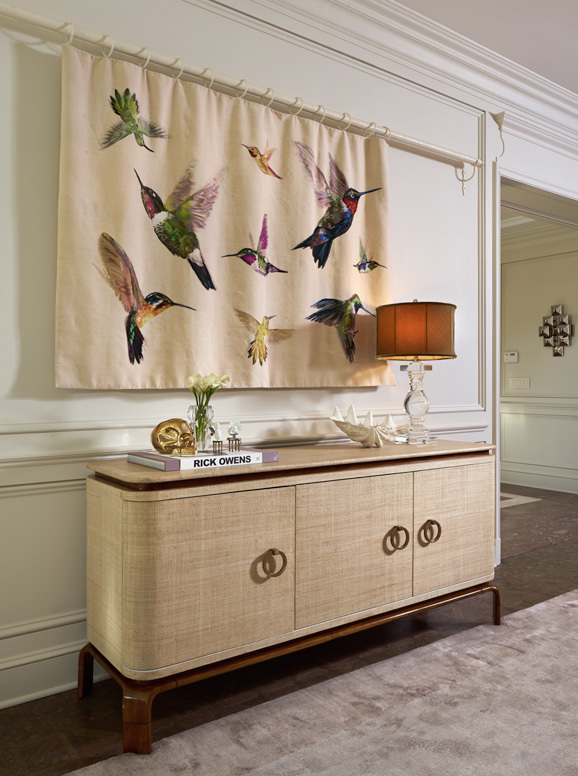 Above the buffet console is a hummingbird tapestry from the Alexander McQueen collection for The Rug Company that can be pulled to the side. Slide left and right to view additional photos in this gallery. A rock and leaded crystal chandelier hangs above the custom fabricated dining room table.Photo by David Cobb. The eight-panel Chinese Coromandel screen has been a fixture in the home for three generations. Photo by David Cobb. The luxurious chaise is from the 1818 collection, while the cloverleaf ottoman was custom designed for the space and subsequently added to the Sees’ furniture line. The blue rope-wrapped sculptural piece is by French artist Christian Astuguevieille. The door hardware is cast bronze by Rock Mountain Hardware from Designer Hardware by Faye in Oklahoma City. “We worked closely with the design team to provide all the plumbing fixtures and hardware throughout the house,” says store owner Garvin Boyd. The dining room is decidedly more feminine. The custom fabricated white-stained table seats 10 when the leaf is added. 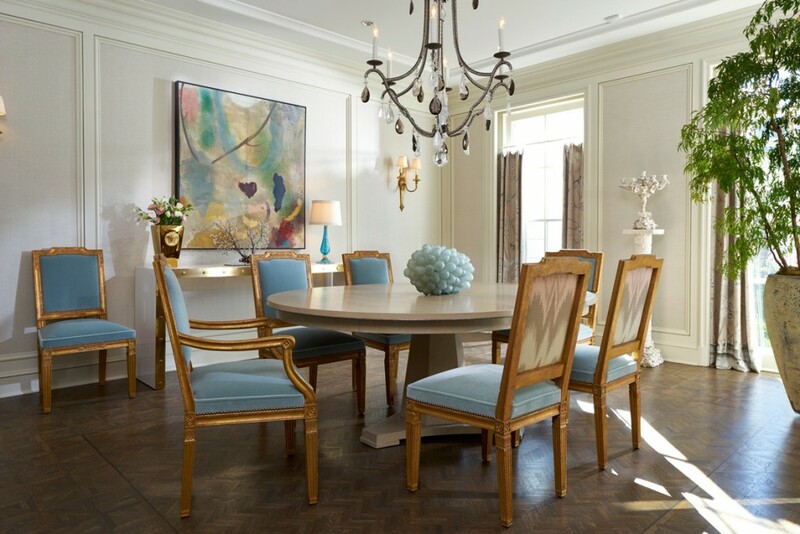 The room is accented with a rock-and-leaded-crystal chandelier, a Shelley Horton-Trippe painting and a pedestal with a candelabra appliquéd with small seashells. “The new owners wanted to make this house their own but approached it as though it was a family heirloom,” says See.